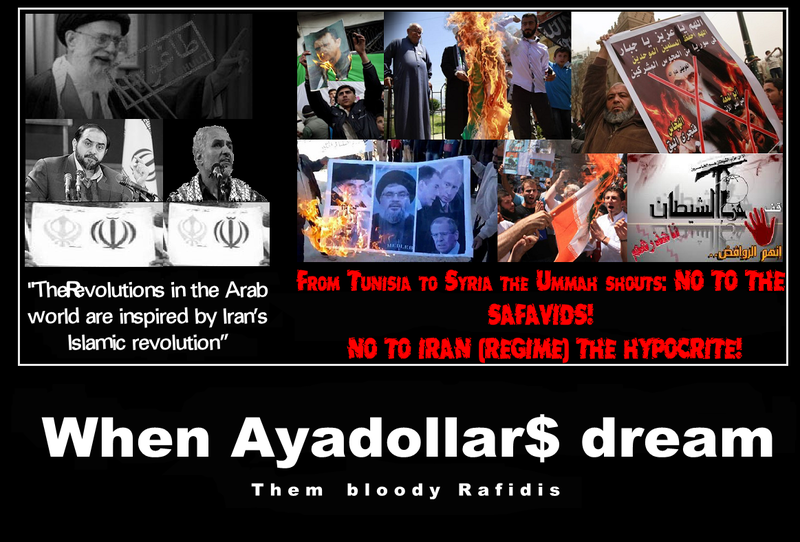 The following post, a month old is really worth to linked by our page, but before reading it we’d like to remember our dear readers to the following article which proves the lunacy of the Shia Rafidha clergy and the Iranian regime who seriously believs that they are the representatives and supporters of the ‘oppressed’ in the world or even more ridicolous that there failed and polytheist and unjust and hijacked (by Mullahs, see here>>>) revolution and ideas (polytheist Shiism) will be imported to the world (particularly the Islamic world that never hated the Shia clergy and the Shia as it does today! Heck, Iranian Shia themselves leaving Shiism in DROVES>>>, particularly in south Iran>>>). 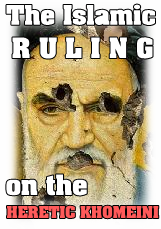 In old times, whenever the Rafidha clergy and the Iranian Shia state was attacked, the Mullahs could bring up the excuse that those who impose them are secularists and enemies of Islam, like whenever the Iranian embassies was being attacked around the world (a very common phenomena, since the Rafidi clergy has lost the trust of the majority of its own people), the Iranian regime was quick (and mostly right) to accuse secularists, MKO’s and other mostly Anti-Islam and nationalist iranian groups for those assaults. But since the crimes of the Iranian regime (thanks to their own satanic politics) have been exposed even to the most ignorant among the Islamic Ummah, the times of Iran being a role model, or Muslims looking up to Iran are certainly gone. Today the very youth who make up a major part of the religious community in most Arab (and non Arab countries like Indonesia, Malaysia) countries and in fact entered the parliaments (like in Egypt) are attacking the Iranian embassy and the Iranian regime and Shia clergy for their many crimes against Sunnis worldwide and the attacks on Sunni beliefs through Iranian promoted Shia temples, books etc. Iran’s own Rasulullah caricatures! Everybody’s fed up with the Rafidi Republic, even Al-Azhar! When the Rafidi Mullahs used to pledge allegiance and how they conspired their way to power. Policy discussions here in the U.S. about Iran and its nuclear program most often focus exclusively on Israeli concerns. Ignored are Arab and Muslim attitudes, especially those of Iran’s Arab and non-Arab Muslim neighbors. It is known that several Arab governments have problems with the Islamic Republic in Tehran, but what of their publics? Over the past decade, we have been polling regional attitudes toward Iran and its policies culminating at the end of 2012 with a survey of 20,000 citizens in 17 Arab countries and three non-Arab Muslim countries (Turkey, Azerbaijan, and Pakistan). This 20 nation poll covered a range of topics including: attitudes toward Iran, its people, culture, and its nuclear program. Comparing our most recent findings (compiled in my new eBook Looking at Iran: Iran’s Rise and Fall in Public Opinion) to the data from our earlier surveys in the region reveals important and dramatic changes in Arab and Muslim attitudes toward Iran. It also helps to identify factors that appear to serve as “drivers” behind these changes. For example, when we polled on many of these same issues in 2006, Iran’s favorable ratings in Arab and Muslim countries were at their highest point. Back then, in most countries, Iran’s favorable ratings were in the 75 percent range (with Saudis giving Iran an 85 percent rating). Six years later the tables have turned. Now Iran’s favorable ratings in these same countries have fallen to less than 25 percent (Saudi ratings have plummeted to 15 percent). in 2006, Iran’s favorable ratings in Arab and Muslim countries were at their highest point. Back then, in most countries, Iran’s favorable ratings were in the 75 percent range (with Saudis giving Iran an 85 percent rating). Six years later the tables have turned. Now Iran’s favorable ratings in these same countries have fallen to less than 25 percent (Saudi ratings have plummeted to 15 percent). What emerges from our 2011 and 2012 polls is that the earlier favorable attitudes toward Iran were not about Iran, per se. Instead they appear to be more a reaction to Arab public opinion’s fury at Israel’s behavior and U.S. policies in Lebanon, Palestine, and Iraq, coupled with the perception that Iran and its allies were standing firm in opposition to the “machinations of the West.” What changed in 2012 is that the United States has lowered its regional profile, while Iran is perceived to be playing a divisive role in Iraq, Bahrain, Lebanon, and Syria. What also emerges from our 2012 survey is the presence of a worrisome sectarian divide that has taken hold in several countries, with Sunni attitudes largely opposing Iran and its regional policies, and Shia communities in many of these same countries expressing support for Iran. There is a growing consensus among both Sunni and Shia Muslims that Iran and its policies are contributing to this sectarian rift. There is, however, a limit to Iran’s appeal in the Arab World and that is the result of the important role that Arab culture and identity play as unifying factors in shaping attitudes across sectarian lines. There was a time, just a few years ago, when favorable Arab public opinion of Iran in some countries stood poles apart from the positions of their governments with respect to Iran and its policies. Some observers made much of this, suggesting that the concerns with Iran’s policies expressed by Arab governments were out of touch with their publics. That may have been true in 2006, but after Iran and its allies overplayed their hands in several countries (with Syria being the “nail in the coffin”–majorities in 17 of the 20 countries covered in our 2012 survey oppose Iran’s involvement in Syria), that gap has now been erased. Most Arabs and Muslims now hold decidedly negative views of Iran and are solidly opposed to Iran’s regional ambitions. The same is true of Arab and Muslim attitudes toward Iran’s nuclear program. Back in 2006, when Iran was seen as the bastion of resistance to the West, their nuclear ambitions were supported and defended by majorities in most countries. Our earlier polls show Arab and Muslim public opinion supporting Iran’s claim that the program was for peaceful purposes. Whether peaceful or not, strong majorities in almost every country were opposed to any international effort to impose sanctions or use military means against the Islamic Republic. Today, there is virtually no support for Iran’s nuclear ambitions — with majorities now believing that Tehran has designs on producing a nuclear weapon. And sympathy for Iran has been replaced by widespread support for sanctions to stop Iran should it persist in advancing its nuclear program. The lesson is clear. When Iran was seen in the Arab and Muslim Worlds through the prism of U.S. and Israelipractices, it won. But when Iran is judged by its regional behavior and its domestic repression, it loses support in Arab and Muslim public opinion. Opposition to the use of military force remains high, with strong majorities still against it. But here too there has been a change, with some increase in the number of those who now support the use of a military strike should Iran persist with its nuclear program. The lesson is clear. When Iran was seen in the Arab and Muslim Worlds through the prism of U.S. and Israeli practices, it won. But when Iran is judged by its regional behavior and its domestic repression, it loses support in Arab and Muslim public opinion.